Before Guts became the Black Swordsman, he was just a boy raised by an abusive mercenary. Like a beaten dog, Guts doesn’t know any better. However, his life is changed when he learns just how terrible a father Gambino really is. Guts is sent on a path that leads him right into the path of Griffith. The man Guts is on a mission to kill in the present. The man who became an inhuman demon of such power that Guts, despite all his vaulted strength and prowess as a demon killer, is nothing more than an insect to. 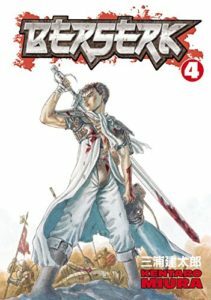 Here, in the fateful encounter during the fall of a castle, Guts discovers what he has been searching for all his life. And what will send him into such anger and hatred when he loses it. The Golden Age Arc is underway. It is one of the best parts of Berserk. You know that it is going to end badly. You know that the young, charismatic Griffith who has inspired his loyal Band of the Hawk, is going to do something that changes him and brands Guts as a sacrifice. As we learned in the last volume, to become a demon, you have to sacrifice someone you love. What do you have to sacrifice to become the GOD of the demons? Miura introduces us to the characters that we’re going to love and hate over the next volumes. The brash and surly Corkus, Casca who gave up being a woman to be a soldier, the quiet by gentle Pippin, the joking and intelligent Judeau, little Rickert eager to help support everyone else. And Griffith himself. BERSERK isn’t just about the violence (which there’s plenty of) or the gore (lot of that), it’s about characters. And Miura is a master at not only giving his characters depths through their dialogue and actions, but through his art itself. He brings these characters to life as he lulls you into a world that you don’t ever want to leave. But in the back of your mind, you remember what is coming and you ask yourself, how did that happen? Miura is about to show us. You can buy BERSERK Vol 4 from Amazon.